This public article was written by Admin Sheep, and last updated on 30 Apr 2016, 05:18. So you're here to learn about flags! 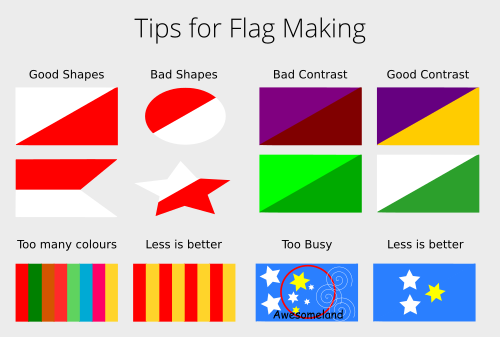 This article will cover the basic flag designs found in real-world flags (and are available under the flag info pages), and some good tips for flag design. First thing to consider is the shape and size of your flag. Most real world flags of sovereign nations are rectangular. There are of course exceptions, such as the square flag of Switzerland, or the oddly shaped flag of Nepal. You can pretty much have it any shape you want, however you must remember that the left-hand side of the obverse (front) of a flag should be straight. This is so that it can be easily fixed to poles and flown. Not much point in a flag you can't fly! Secondly, the size - or rather proportions or ratio - should be important to consider. The most common proportions are 4:3, 2:1, and 3:2 (where the first number is the width relative to the second number: height). Again, you can make this anything you want however. Colours are probably the most memorable part of a flag in some cases, so it's good to pick colours that will work. The first thing to take care of is not picking too many colours (excluding any emblems etc) as this complicates the flag and can make it less recognisable. One thing to also consider when picking the colours is the culture of the people it represents. The colours must be important to them, and should mean something to the culture. Also consider that when the flag was invented in your culture's timeline, what colours were available to them? What colours were largely in the environment around them? Were they able to produce certain colours (ie. dyes etc)? Lastly, and pretty importantly, contrast. Pick colours that will contrast together very well, and place them accordingly on the flag. For example, a half black, half white flag contrast incredible well, while a half purple, half red flag do not. This is important as a flag should be recognisable from a distance, and colours that do not contrast well will not be recognisable; or possibly even visible. These are things like coat of arms, animals, people, writing etc that are used on your flag. These are good to use if it adds meaning to the flag (such as something that it important to the culture), but don't overdo it. You want the rest of your flag to be noticeable also. Furthermore, it's always good when people are easily able to draw a flag themselves, and don't have to try and draw complicated images as well. The below table shows you the basic design patterns that a lot of flags use. Given are some real world examples also. Canton Something in the top-left quarter. Greek cross A cross that does not touch the edges of the flag. Pales Any number or sized vertical divisions/stripes. Fesses Any number or sized horizontal divisions/stripes. Chevron Triangular division along any edge. Emblem/Symbol Mentioned in the above section. Serration Zig-zag or wavey-lined division. Radial Divisions that radiate from a central point (not necessarily the centre of the flag).